The Martinsville Truck Series dates back to its opening season in 1995. Since then, there has been 40 races and counting, with two event each year since the 2003 season. 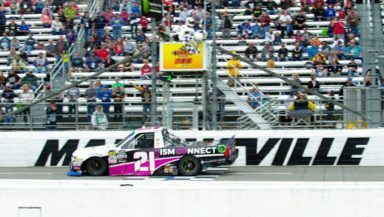 With Martinsville being a famous and popular race track on the Truck Series circuit, many teams are trying to make the race. In fact, 40 trucks are entered on the preliminary entry list for 32 spots. So without further ado, here’s a look at who might collect a grandfather clock Saturday afternoon. Kyle Busch – It’s hard to stop someone who is on a roll, especially someone who has won in all three national series. Kyle Busch recently won at California for his 200th win overall and does not look to be slowing down anytime soon. He is also a recent winner in the Truck Series winning at Atlanta and Las Vegas before the trucks went on a break. Busch looks to collect his third victory of the 2019 season as he enters Saturday’s race. At Martinsville, he has just one win coming three years ago in 2016. He has led 415 laps in total and has five top fives and six top 10 finishes. His Kyle Busch Motorsports’ drivers have a combined five wins in total. In the 2016 race, Busch dominated leading 123 of the 255 laps. Look for Busch to win again this weekend. Johnny Sauter – Sauter is the most recent winner of this race, claiming the victory in October 2018. That race advanced him to the Championship 4. He whooped the field leading 148 laps of 200 and won both stages. He has 22 starts and four wins (2011, 2013, 2016, 2018). Sauter also collected nine top fives and 12 top 10 finishes with 579 laps led. It wouldn’t be a surprise if Sauter goes back to back this weekend. Darrell Wallace Jr. – Wallace Jr, better known as Bubba, will be making his first Truck Series start this season driving the No. 22 AM Racing entry. Before making starts in the Cup Series, Wallace made a name for himself in the Truck Series for Kyle Busch Motorsports, where he won five out of six races. It will be his first Martinsville start in over five races. His last start was in 2014 where he dominated, leading 97 laps of 200 and winning from the pole. He also won in 2013. Matt Crafton – Crafton could break his long winless streak this weekend at the ‘Paperclip.’ He has the most starts of any active driver with 34. Crafton collected wins at Martinsville in 2014 and 2015 leading a combined 110 of 456 laps. In total, he has completed 97.5 percent of the laps, nine top fives, 19 top 10s with two DNFs. Crafton has led 385 laps and sat on the pole in 2011. He’ll be hungry to get back to victory lane this weekend. Myatt Snider – Snider returns this weekend in the No. 27 ThorSport entry. In his only two races, Snider has finished third and sixth with seven laps led. He finished 10th and ninth in both stages in the 2018 spring race. Snider could be a surprise winner this weekend. To note, Travis Kvapil is back in the No. 1, Austin Dillon in the No. 8 Nemco Motorsports entry, Codie Rohrbaugh in the No. 109, Juan Ma Gonzalez in the No. 10, Tyler Ankrum in the No. 17, Derek Kraus in the No. 119, Daniel Sasnett in the No. 34, Anthony Mrakovich in the No. 43, Reid Wilson in the No. 44, Raphael Lessard in the No. 46, David Gilliland in the No. 54, Timmy Hill in the No. 56 with his own team, Dawson Cram in the No. 63, and Austin Theriault in the No. 92. The No. 80 team has yet to be announced. The winner’s list is a who’s who of NASCAR’s best dating back to Joe Ruttman winning the first race here in 1995. Since then, Jay Sauter, Jamie McMurray, Bobby Labonte, Ricky Craven, David Starr, Kevin Harvick, Denny Hamlin, Joey Logano, Chase Elliott and Noah Gragson, just to name a few, have all won here. Starting position here at Martinsville is very important, where the race winner has won from the pole nine times. The lowest a race winner has come from to win was 33rd in 2002, set by Dennis Setzer. On-track action begins Friday afternoon with the first practice at 1:05 p.m. ET and the final practice at 3:05 p.m. ET, both lasting one hour. Unfortunately, there will be no television coverage of the practice sessions. On Saturday morning at 10:40 a.m. ET, Truck Series qualifying takes place with multi-vehicles in three rounds, live on FOX Sports 1. The TruNorth Global 250 begins with NASCAR Raceday at 1:30 p.m. ET with the green flag flying shortly after 2:00 p.m. ET live on FOX and MRN Radio.